Yesterday, I had a branding and marketing conversation with my literary mentor and brothalove Ethelbert Miller. Ethelbert is a native New Yorker who dances through life as a man of many talents: husband, father, poet, literacy activist, and founder of the Afro-American Resource Center at Howard University. Like me, he is also a Howardite! I affectionately call him E-bert! I spent most of the time listening to E-bert share his insights on ways to define, expand, and market my “Ananda Leeke” brand. Parts of the conversation were uncomfortable. Why? Well, E-bert was telling me the TRUTH … I didn’t want to hear it because it meant I would have to do MORE WORK! I resisted a lot of what he had to say, but managed to remain somewhat open. E-bert gave me a lot to think about. He also reminded me I would find my way using my spiritual path. His words “using my spiritual path” stuck with me. They followed me into my evening yoga and meditation practice. The end result was a clearing… an opening to E-bert’s questions and insights. This morning I sat in meditation and focused on strengthening my inner foundation with deep breathing, mantra chanting, and a mudra practice focused on the root chakra. Guess what happened? I was able to be still and hear my inner voice repeat a short and sweet phrase: Yoga + Creativity + Internet Geek = Ananda Leeke. BOO–YAAAAAAAAA!!!!!!! I knew the phrase was a rebranding gift from the universe! What a blessing! So the Ananda Leeke official marketing brand is now: Yoga + Creativity + Internet Geek = Ananda Leeke. As E-bert says, “my marketing brand is my gimmick!” You know the thing that will get folks’ attention. Visit www.anandaleeke.com to see more of my new changes. Check out my bio too. I still have to add a lot of content to the site in April and May. For now, I am satisfied with the blessings. And I know there are more to come. So get ready for new surprises on AnandaLeeke.com! Oh yeah, here is a great article I read about rebranding yourself on Times Online: http://www.timesonline.co.uk/tol/life_and_style/women/body_and_soul/article3416498.ece. videos and photos featuring her favorite jazz singers and musicians. Be sure to visit Ananda on the social media sites listed below. 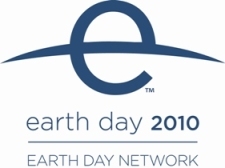 2) Begin April by listening to Ananda share her favorite poems about jazz, poetry, springtime, Cherry blossoms in Washington, DC, green living, and Mother Earth (in celebration of the 40th Anniversary of Earth Day) on April 1 from 7:00 a.m. to 7:15 a.m. EST on BlogTalkRadio. http://www.blogtalkradio.com/anandaleeke. 3) Join Ananda for an author talk about poetry as a natural medicine for the soul on April 8 from 9:00 p.m. to 9:30 p.m. EST on Ananda Leeke Live! UStream.tv. During the talk, Ananda will share how she uses poetry in her work as an artist-in-residence for Smith Farm Center for Healing and the Arts. http://www.ustream.tv/channel/ananda-leeke-live. 4) Participate in Ananda’s free kind and gentle yoga Meetup class on April 18 from 11:30 a.m. to 12 noon at Malcolm X-Meridian Hill Park in DC (16th Street and Florida Avenue, NW – in front of the waterfall). If it rains, the group will not meet. The class will be dedicated to National Poetry Month, Sexual Assault Awareness Month, and the 40th anniversary of Earth Day. BRING YOUR OWN MAT. Mats are NOT provided. Click on the link for more details: http://yoga.meetup.com/584. 5) Join Ananda for a creativity coaching session on how to identify your inner critic on April 29 from 9:00 p.m. to 9:30 p.m. EST on Ananda Leeke Live! UStream.tv. The session will include exercises from Ananda’s new book That Which Awakens Me: A Creative Woman’s Poetic Memoir of Self-Discovery. http://www.ustream.tv/channel/ananda-leeke-live. In honor of Women”s History Month, I attended an afternoon talk at the National Museum of African Art featuring one of my favorite sculptors Sokari Douglas Camp. 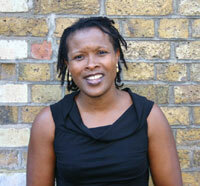 She is originally from Nigeria and currently lives in London with her family. The first time I saw Sokari’s work was in 1999 when her Church Ede, A Tribute to Her Father, was on exhibit at the National Museum of African Art . Listen to my Cinchcast audio blog below to learn more about my artist visit. Have you taken yourself on an artist date lately? What museums have you visited this year? Have you discovered any new artists? 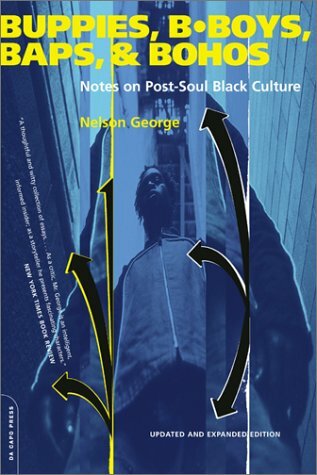 Yesterday, I started reading Nelson George’s Buppies, B-boys, Baps, and Bohos: Notes on Post-soul Black Culture (2001). I am using George’s book as research for my new novel Love’s Troubadours – Symon: Book Two. Like my main character Symon Allure, George was born and bred in Brooklyn. Symon also represents a buppy, b-boy, and boho. Do you know what a buppy, b-boy, bap, and boho stand for? Check out Publisher’s Weekly description of George’s book (from Amazon.com) below. Village Voice columnist George has already established his scholarly depth and his gift for stylish, finger-on-the-pulse reporting on black music with his The Death of Rhythm & Blues and Where Did Our Love Go? The Rise & Fall of the Motown Sound . This collection of articles, nearly all of them reprinted from the Village Voice , marks him also as a knowledgeable, entertaining critic of African American popular culture generally and its pervasive influence on American life. Beginning with an astute, comprehensive, polemical time line, “A Chronicle of Post-Soul Black Culture,” George traces black mass culture from the 1970s “blaxploitation” films through Alex Haley’s Roots saga and comic Richard Pryor’s sociopolitical humor up to the explosive popularity of hip-hop. His observations on the origins of rap in New York City black neighborhoods are valuable, and two probing essays–on the fatal 1985 shooting by a white Manhattan police officer of black Phillips Exeter Academy student Edmund Perry, and on the near-cosmic importance of basketball among black teens–vividly illustrate George’s sensitivity to the social complexities of African American life. Having a Nina Simone “Feeling Good” Day After President Barack Obama Signed Healthcare Legislation! This morning I woke up with so much inspiration and energy. Nina Simone’s “Feeling Good” was playing on my inner iPod! I felt like I did when I woke up on November 5, 2009, the day after we elected President Barack H. Obama to serve as the leader of the United States of America. What a great feeling! America is making history once again by ensuring all Americans have access to good healthcare. 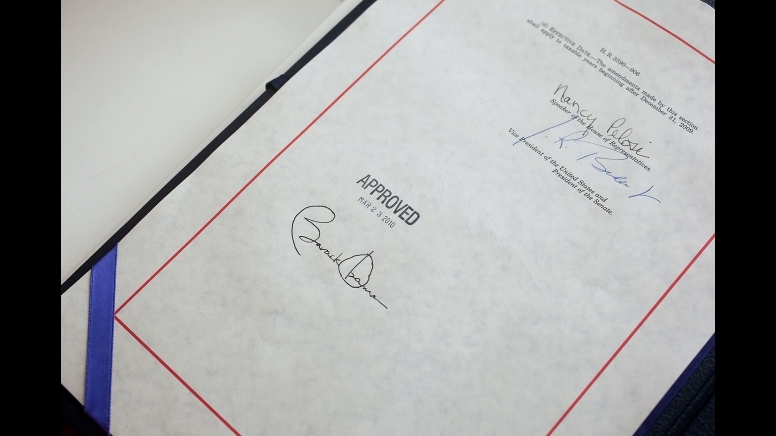 To learn more about what’s in the healthcare legislation, visit Whitehouse.gov’s blog: http://www.whitehouse.gov/blog/2010/03/23/whats-health-care-bill. Last night I watched the Whitehouse.gov video of my President signing the healthcare legislation. What a historical moment! It was huge! Click here to watch the video and read my President’s remarks. See an excerpt of my favorite part of his remarks below. “Our presence here today is remarkable and improbable. With all the punditry, all of the lobbying, all of the game-playing that passes for governing in Washington, it’s been easy at times to doubt our ability to do such a big thing, such a complicated thing; to wonder if there are limits to what we, as a people, can still achieve. It’s easy to succumb to the sense of cynicism about what’s possible in this country. But today, we are affirming that essential truth -– a truth every generation is called to rediscover for itself –- that we are not a nation that scales back its aspirations. (Applause.) We are not a nation that falls prey to doubt or mistrust. We don’t fall prey to fear. We are not a nation that does what’s easy. That’s not who we are. That’s not how we got here. I know the healthcare legislation is not perfect. We still have a lot of work to do to ensure universal coverage for everyone and funding for women to have access to federally-funded abortions. We still have to overcome challenges and kinks that come with new legislation. More change is sure to come. However, we are much better off than we were without healthcare reform. We have something to work with. We have a foundation to move forward. And I am fired up and ready to go! Are you? What do you think about the healthcare reform legislation? PS: My new book That Which Awakens Me (available on Amazon.com) includes a chapter that discusses my reflections on President Obama’s campaign and election. Here is an excerpt from the chapter. Enjoy! Election night was unseasonably warm in D.C.
table at The Islander, a Caribbean restaurant. It was filled with Obama supporters. You could feel the need for great change in the air. It was one-of-a-kind election memorabilia. results posted on the television screen. It was post-traumatic Bush stress order. results as they poured in each hour. So I said my goodbyes and walked home. It was my way of positively affirming America had changed. meditated, and watched “Young and the Restless” online. That’s when I started to get excited. Barack was leading the race. He won, but I didn’t trust the results. So I called my mother to confirm the news. give his acceptance speech, I knew the news was true. I screamed so loud, “Yes We Can,” into the phone. I knew I had to join the party. Calling all creative women! 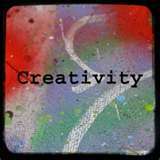 Join me for a free creative coaching session on March 25 from 9:00 p.m. to 9:30 p.m. EST that explores the nine blocks to women’s creativity. I will use creative coaching exercises in my new book That Which Awaken’s Me to guide the session. Click here to watch the live show. If you miss it, don’t fret. You can watch a video recording. Just visit the web site for Ananda Leeke Live! on UStream.tv. If you are in DC this weekend, consider taking my free kind and gentle yoga class on March 28 from 11:30 a.m. to 12 noon at Malcolm X-Meridian Hill Park. Click here for more details. The class will be dedicated to National Women’s History Month, National Women and Girls HIV/AID Day, and National Nutrition Month. I will also share an excerpt from That Which Awakens Me during the meditation part of the class. Please share these events with your network! PS: Check out my new memoir That Which Awakens Me and debut novel Love’s Troubadours – Karma: Book One on Amazon.com. They are great for spring and summer reading! They also make great gifts for Mother’s Day, graduations, birthdays, etc. Nordette also interviewed me on the March 20th episode of We Got Word on BlogTalkRadio. Click here to listen to the interview. We had a great time talking about healing fiction, my debut novel Love’s Troubadours – Karma: Book One, and social media tips for authors and bloggers. I also discussed my new writing project Sisterhood, the Blog: Soundbytes from the 21st Century Women’s Online Revolution. Listen to Ananda read a poem that celebrates creative women who inspire her. This morning I went walking in my neighborhood. During my walk, I thought about creative women who inspire me. So I recorded an audio blog when I returned home that includes my poem “21 Drops of Inspiration in My Creative Bucket.” It celebrates creative women such as Toni Blackman, Tanekeya Word, Sonya Clark, Jade Andwele, and Amber Robles-Gordon. The poem is featured in my new book That Which Awakens Me (available on Amazon.com). Click on the Cinchcast below to hear the poem. Enjoy! Last week I applied to speak at IgniteDC which will be held on June 16. “Who lives inside of me?” is the topic of my five-minute presentation. Click here to read my short proposal: http://www.ignite-dc.com/speakers/369. My sistalove Jessica Solomon, founder of Spark Creativity and The Saartjie Project and also applied. Check out her proposal on “Perceived Weirdness Index”: http://www.ignite-dc.com/speakers/359. It is a fabulous concept! I know IgniteDC will select it! I also submitted a proposal for the BlogHer 2010 Community Keynote which will be held in August in New York City. 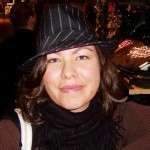 Click here to read why I submitted the proposal: http://www.blogher.com/who-lives-inside-me. Here’s the link to the blog post: https://authoranandaleeke.wordpress.com/2010/03/19/who-lives-inside-of-me. What do you think about my proposals? I am using them to prepare short and medium size talks based on excerpts from my new poetic memoir That Which Awakens Me. I am also going to create a PowerPoint presentation that will be posted on SlideShare in a week or two. More good stuff is coming!!! !